As on every papal trip, Pope Francis’ visit to Myanmar and Bangladesh included a mix of meetings with government officials and events focused firmly on the nations’ Catholic communities. The political implications of his Nov. 27-30 stay in Myanmar and his Nov. 30-Dec. 2 stop in Bangladesh grabbed the headlines mainly because of the situation of the Rohingya people, a Muslim minority being pushed from Myanmar’s Rakhine state and seeking refuge in Bangladesh. But the political and pastoral sides of his trip were interwoven, including his attention to the Rohingya and his defense of their rights. 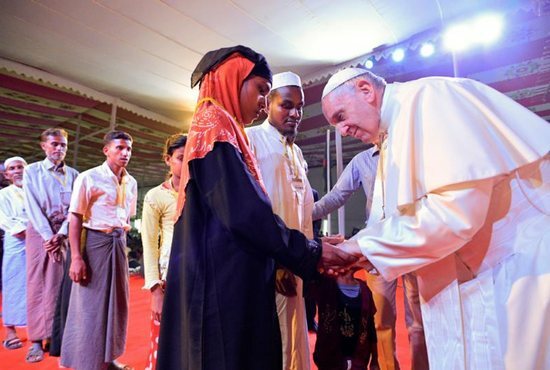 Meeting Rohingya refugees at the end of an interreligious gathering in Dhaka, Bangladesh, Dec. 1, Pope Francis said each human being is created in God’s image and likeness. “Today, the presence of God is also called ‘Rohingya,'” he said after listening to each of the 16 refugees briefly tell their stories. The Catholic communities in both Myanmar and Bangladesh are very small; Catholics make up slightly more than 1 percent of the population in Myanmar and only a quarter of 1 percent of the population in Bangladesh. Yet, in both countries, the influence of the church is disproportionately large because of the contributions of Catholic schools, hospitals and other activities. In Myanmar, the majority of people are Buddhist and in Bangladesh the majority are Muslim. On the return flight to Rome Dec. 2, Pope Francis was asked about how a Catholic should balance a commitment to interreligious dialogue and a commitment to evangelization with the hope of welcoming converts into the church. The key, the pope said, always is witness. It is not a Christian’s job to try to persuade someone to become Christian. That is the Holy Spirit’s job, he said, but individuals must prepare the way by offering a living witness of what it means to be Christian. The pope met privately with a varied group of religious leaders in Myanmar before holding a formal meeting with leaders of the nation’s Buddhist community Nov. 29. Quoting Buddha and a prayer attributed to St. Francis of Assisi, the pope insisted that in a land where the powerfully bonded pairing of religion and ethnicity have been used to prolong conflict, it was time for religious leaders to reclaim the greatest values and virtues of their faith traditions. Pope Francis also held separate meetings in both countries with the nation’s bishops. In Myanmar, he told the bishops that the idea that differences are a threat to peaceful coexistence is an example of an “ideological colonization” sweeping the world and trying to make everyone the same. Before leaving the country, he celebrated Mass Nov. 30 with thousands of young people from throughout Myanmar. He told them to be messengers of the Good News of God’s love and mercy. Witness was also the theme he highlighted at a large Mass in a park in Yangon, Myanmar’s capital. In Bangladesh, his only public Mass was celebrated Dec. 1 and included the ordination of 16 priests, who came from different dioceses and religious orders. He read the prescribed homily from the rite of ordination, but then spoke off the cuff to thank the thousands of people who had traveled far for the Mass. He also encouraged them to pray for their priests. The next day, before leaving Bangladesh, he met with priests, religious and seminarians at Holy Rosary Church in Dhaka. He told them the harmony, mutual respect and peace that should reign in relations between members of different religions must first be found between members of the Catholic Church.